This article contains information on Destiny 2 Midtown in PVP mode. It contains tips, tricks, and strategies for PVP in order to win. 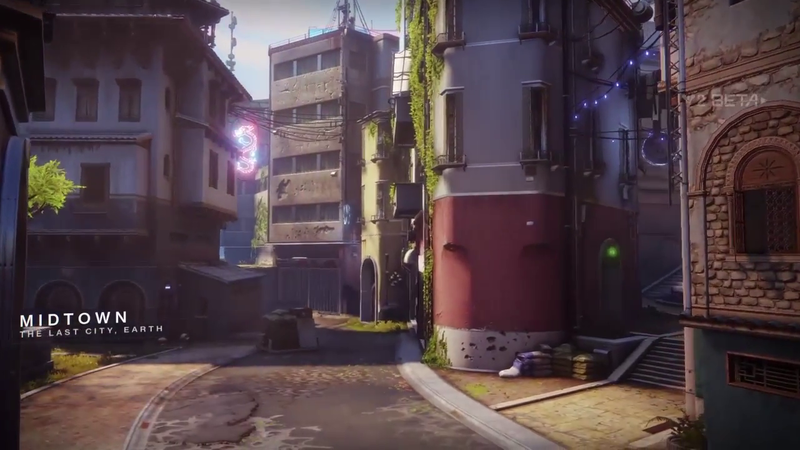 Destiny 2 Midtown is one of the first maps to be revealed in the beta. They have narrow alleys and corridors, making it easy to ambush the enemy. This makes it easy for either close range combat or full-range shoot outs in the all-new Countdown Mode. However, Destiny 2 Midtown hasn’t revealed what are the possible playable modes for this map. Nonetheless, there is still the traditional shoot out. Destiny 2 Midtown makes it ideal for players to play countdown as there are many places to hide and take down an enemy. It’s a map that somewhat makes a sci-fi tribute to Counterstrike. Countdown basically is similar to Counterstrike’s normal set up the bomb mode. However, there’s a difference. Players can plant multiple bombs should one of their bombs end up being defused. Try planting the bomb in “Rugs” as it’s the easiest place for you to get to. It has multiple access points, making it easy for the team to enter in and out. It also appears to be quite defendable. Taking the Rugs area early makes it more difficult for the enemy team to retake it back. Head towards the bridge if you plan more for a snipe-like strategy. There’s a bridge that marks the midway between the market and the two spawn points. From there, the player can snipe players from above as they scramble down below. Don’t just charge in like Leroy Jenkins. Like every other game that involves coordination, charging in like Leroy Jenkins will not only get you killed. But, it’ll also lose the team fight in terms of numbers. Also, taking a more unconventional route which involves taking some detours may catch the enemy off guard. Look for the middle of the map. It’s the nearest to the bomb site. As tempting as it is, don’t just run in. Make sure you have cover fire. If you’re not in the middle of the map then, make sure you have someone in the middle. The middle of the map has a double door opening leading to another corridor. You can either use this hide or make your way to the small plaza to skirmish. Capturing the plaza’s important as it leaves you easy access to the foe’s bomb site. If you’re in Destiny 2 Midtown Map, you’re going to need that easy access. Attacking the Market requires a zerg-like coordination. If you’re going to use the Market, the battle will depend heavily on numbers. Focus fire down your enemies to quickly whittle down their numbers. Collect the power ammo. It’s near the attackers’ spawn and you’ll be able to oneshot defenders easily. Cover all your bases especially in regards to where your bomb is. The moment you do, you become vulnerable to grenades. Split up to defend equally. This will allow you to cover more ground and lock down certain pathways. This will allow you and your allies to figure out strategies. Best to also take note as to what job class they are to figure out which one to take out first. Warlocks are the best known for this. They have Rifts that can heal and empower allies, allowing your team to hold the fort. Barriers can come from the Titan class. Rotate a bit if there’s nobody there. Having a better view of the arena’s always helpful when defending a particular point.